Being able to enjoy vaping on demand shouldn't have to mean paying a high price for a portable vape. That's the philosophy behind the DaVinci Vaporizer - which is packed with impressive features and a real value for its price. The brand is named after the famous painter and is truly a masterpiece of design and technology. Seeing that portability is essential, the engineers at DaVinci set out to develop the most efficient handheld vaporizer ever designed, as different herbs and essential oils all require a specific temperature to produce great vapor, limited to impurities. That is why it has a digital temperature control system which allows you to adjust the temperature according to your needs. The DaVinci Vaporizer is small and can be used almost anywhere. Unlike other portables that may run on batteries but are far from easy to carry, the DaVinci vaporizer is just 3.9 inches by 1 inch by 2.25 inches in size, weighting only .35 pounds. 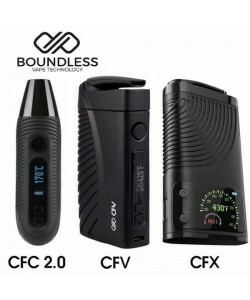 When compared to other portable options, it is equally sized or smaller than almost every other model on the market today, making it one of the best vapes for anyone who is looking for an easy-to-carry on-the-go solution. With the original DaVinci, you're not locked into one particular style of vaping. The device can be used as a dry herb vaporizer with your favorite blends, and as a wax vaporizer with your favorite concentrates. The design even includes two oil cans that allow you to vape essential oils. As a handy additional feature, this model features a storage compartment where you can store a filled oil can or hold enough herbs to fill the vape three times over. Many of the portable vaporizers on the market today force you to settle for one temperature setting. But this can pose a risk for combustion with some types of vaping materials and negatively impact vapor quantity and quality. The DaVinci Vaporizer available for sale above eliminates this problem with its precision digital temperature control system, which allows you to adjust to the ideal temperature levels between 100 and 430 degrees Fahrenheit. You can set the vape quickly with the up and down arrows, and it's even possible to turn the temperature scale to Celsius if you wish. Although the DaVinci Vaporizer features advanced technology, it is very easy to use. You won't have to spend hours reading the manual to find out how to use it. Once you fill the heating chamber, you simply turn it on and enter the temperature. The indicator light will change from red to green in about 90 seconds, indicating that it's time to vape. Then, simply draw slowly for 10 to 15 seconds and repeat as desired. 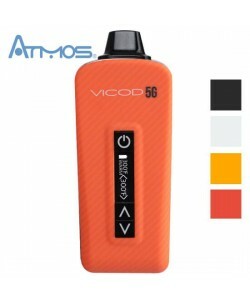 To make this model one of the best portable vaporizers possible, the brand has used top quality materials in its design; heating chamber is made out of stainless steel, so it is very strong and highly resistant to corrosion. The heating element is finished with genuine gold-plating, allowing it to heat up incredibly fast. The unit is a conduction vaporizer, meaning that it heats up your vaping materials by directly transferring heat to speed up the rate of vaporization. Part of the reason why there are so many glowing DaVinci vaporizer(s) reviews online is because its designers took a great care to make the kit a solution to a number of common complaints that people often have about many other vapes. A perfect example is the design of the mouthpiece, which is called the flex straw; made from food grade silicone, this flexible mouthpiece won't snap off or break the way metal or glass mouthpieces can, and it is incredibly comfortable to draw from. This original handheld model by DaVinci's also features a snap-down lid with a latch to help prevent spills. The kit even includes a cleaning brush that is designed to hide away inside of the device for easy carrying. Made from heavy-duty plastic, the exterior of the DaVinci Vaporizer is impact resistant and ergonomically designed to make it comfortable to hold for long periods of time. The unique grip design also reduces the risk of slipping out of your hands. If this vaporizer does suffer an accidental fall, the heavy-duty internal components are unlikely to break as they are built to military spec standards for durability. The DaVinci Vaporizer features a lithium ion battery that can power it through 10 to 15 cycles of vaping on a single charge. To conserve battery power, the unit shuts off automatically when it is not used for more than 10 minutes. Comes in every box there is a 110-volt to 240-volt wall charger with pass-through technology, which means that you can vape with your Da Vinci while it's still recharging. The first time that you charge the portable vaporizer, it will require roughly 8 hours for the battery to reach its full capacity. After that, you can charge the built in battery fully in just 2.5 to 3 hours. Warrantied for 2 years by the manufacturer, the DaVinci Vaporizer is sold with a set of spare screens for easy maintenance. You can purchase additional screens, replacement straw mouthpieces and other needed parts above - right here at VaporPlants.com. We also carry a number of other accessories, including a handy car charger. The Da Vinci is a portable convection vaporizer that is compatible with both dry herbs and wax. This vape features precise temperature control and a long-lasting battery, plus - when coupled with its included storage compartment, makes this vape one of the best portable vaporizers around today. Price - selling for $129 may seem high if you're only used to using wax vapes, but it is in fact a decent price for a hybrid vape. Vapor Quality - because of its high melting point, the bronze heating chamber in the Da Vinci provides a pure, clean, flavorful taste. This leaves only the fry herb or wax to vaporize, and because of the precise temperature control, every puff you take from the DaVinci will produce robust clouds. Guarantee - comes with a 2 year warranty. Prep Time - extraordinarily simple to fill and needing only a total of 90 seconds to heat up, the DaVinci vaporizer is great for taking on to go. Portability - it has a nice ergonomic shape, is simple to fill, and will stay charged a while, furthering its portability. It even comes with a built-in stash area so that you can bring along your materials for later use. Ease of Use - simple to fill, but you do have to hold onto the vaporizer while loading it. This shouldn't be much of an issue. Heating and Temperature Regulators - great heating chamber paired with precision temperature control up to 430 degrees Fahrenheit, provides a smooth and clean vaping experience. Power Supply - to charge its lithium ion batteries, you use the 110-240 AC wall charger. It takes around 3 hours, but once charged, the DaVinci can be used for 40-60 minutes. The Da Vinci is a great vaporizer for those who want to have both herbs and dabs on the go. With stash chambers, this is a simple task, and loading the wax or the herbs into the heating element is simple. Once the battery has charged, it is good for around 40-60 minutes of usage, and you can choose any temperature up to 430 degrees Fahrenheit. Overall, this vaporizer is for anyone who wants control of what, when, and how they vape. In conclusion, for a very long time the original DaVinci is the go to portable vaporizer for many, with hours, months and years of proven durability. Recommended for most - unless budget is not of a concern - would be to get newer and better performing DaVinci Ascent, which you can check out and buy here. The original DaVinci vaporizer is one of the most durable models on the market. The price has gone down since it was first introduced, so if you decide to get this kit, it will definitely leave you smiling and satisfied for a very long time. Best vape i ever used hope it stands up to every day use. Lives up to the hype - Review by Barry M.
I am new to vaping and have never used a portable vaporizer but I wanted something that I could take with me on the road. I read many reviews about this vape before buying it and it definitely lives up to the hype that the reviews have given it. Flavorful draws - Review by Linda E.
I am very impressed with the way that the DaVinci Vaporizer heats up quickly, unlike the desktop vapes I have tried. I like that I can change the temperature as I use it because I like to start out low and slowly move up. This gives me the best, most flavorful draws I am noticing. The unit also looks like it was built really well so I appreciate the craftsmanship. I think that the battery could stand to last just a little bit longer but it is nice that I am able to use it while plugged in thanks to its pass-through technology. Worth it - Review by Fidel D.
When it comes to getting the material into the unit, I think that it could have been made easier but it really isn't a big deal because it is worth all of the effort. Gets warm - Review by Bonnie J. The DaVinci Vaporizer gets warm when you use it, but it isn't a bad thing because it does not burn, even when I have it sitting in a shirt pocket. I feel a lot better when using this unit than I ever did with any other portable vaporizer. Ease of use - Review by Lee A.
I love the ease of use that comes with the DaVinci Vaporizer. I have tried a number of different units and this one is by far the best. I love that it lets me have enough room to share it with my friends if I want. It also gave me a great solo session right out of the box after I gave it a full charge. Great vape for cheap - Review by Kendrick H.
The DaVinci Vaporizer can be a little harder to clean even with the brush that it gave me to use, but that is a small price to pay for a truly great vaporizer. Good product - Review by Daniel S.
I love how easily it works with buds when I grind them up fine but I can't pack it in too tightly or it won't work right which is expected. I have never had to worry about it burning my material like some other vaporizers have. Vape on the go - Review by Paula L.
The DaVinci Vaporizer is a great vaporizer for when you want to vape on the go. Really comfortable - Review by Robert C.
It isn't exactly as slim and sleek as some other vaporizers, but it fits in the hand nicely and feels really comfortable and solid so I don't fear that I am going to drop it. It heats up quickly and gets to the designated temperature with ease so that I can hit it virtually whenever I want to without wanting to keep it running all the time. I think that the storage compartment with the rubber lid is really nifty. It can fit nearly five different loads inside of it depending on what kind of material I am using. Easiest vape - Review by Carolyn A. The DaVinci Vaporizer is one of the easiest to use and easiest to clean vaporizers that I have ever used. Lasts entire day - Review by Diane D.
The battery lasts for a really long time, but it does take around three hours to charge which is kind of a bummer. Other than that, this DaVinci Vaporizer is a really solid vaporizer. Simple to clean - Review by Randy C.
DaVinci Vape comes with a brush that makes it simple to maintain and it starts working on vaporizing the material I put into it in what feels like only a few seconds. It also vapes the material easily and smoothly. It leaves the material a nice brownish color that tells me it has saturated it all with ease. Very discreet - Review by Steven A.
I love how discreet it is. It looks like you are drinking something because of its thick and flexible straw so I don't have any worry while vaping it in public. I can even travel with it on a plane if I just clean it out really well. Long lasting battery - Review by Elmer A. The DaVinci Vaporizer has a really long lasting battery and I have never had to worry about it shutting off mid use. Best purchase ever! - Review by Joe E.
I got this after using one of my friend's models, and have never thought about smoking my herbs ever again. Three hours to charge - Review by Robert A. The one downside about the DaVinci Vaporizer that I have to mention is that it takes like three hours to charge up which is kind of inconvenient but it is worth it. Really great herbal vape - Review by Charles J. What it does have is an automatic shutoff after ten minutes, which is great in case I forget to shut it off myself and this is definitely something that happens. It is great for two people to use at a time and offers plenty to go around. I like that I can set the temperature that I choose and I don't have to wait too long for it to heat up. The only thing that I don't like about it is the heat. It not only gets warm to the touch, but the vapor does come out warm, too, so it can be a little irritating and uncomfortable sometimes. Overall, it's a really great vape that is the perfect size for palming it and is discreet enough to take with me on the go. Manual was a little vague - Review by David M.
The DaVinci Vaporizer is awesome except the manual was a little vague so if you are a new user there will be a bit of a learning curve. Heats up very quickly - Review by Virginia D.
The DaVinci Vaporizer is everything that the product description says that it is. It heats up very quickly to the temperature that I set it at and it stays on for a really long time. I love the mouthpiece because the vapor does have a bit of a warmth to it but the mouthpiece helps keep the heat away and disperses it a little bit. Small and powerful - Review by Josie J. It is small enough that it can fit into my cargo pants pockets and feels good in my hand. Gets little hot sometimes - Review by Tanesha M.
Great flavor and vaping quality over all even if the vapor of the DaVinci Vaporizer comes out a little hot sometimes. My Short Review - Review by Steve R.
The Da Vinci is a portable wax and dry herb vaporizer that takes advantage of zero-combustion convection based heating. Capable of reaching temperatures up to 430 degrees Fahrenheit, the Da Vinci's pure, heating element works in harmony with the temperature control and long-lasting batteries to provide a perfectly crisp, clean, and flavorful cloud with every draw. This vaporizer is simple to load and includes "stash pockets" for taking concentrates on the go. With a heat up time of only 90 seconds, an ergonomic design, and a battery that lasts up to an hour, the Da Vinci is a true portable vaporizer that won't let you down. It hasn't let me down yet! 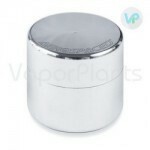 I had spent a great deal of time trying to find a vaporizer online. I went from site to site, not getting my questions answered, being or able to speak with someone regarding various makes and models. When I came to this site, I was ready to get the same poor treatment. Was I ever wrong! I called, and was assisted by a nice person, who answered all my questions, and guided me to various vapes that he felt I might be interested in. If anyone is going to shop online for a vaporizer and supplies, they must come to VaporPlants.com, you will never be disappointed. Congratulations on an excellent site! DaVinci Vaporizer is the way to go in my opinion! Good Portable - Review by Nick J. Just bought my first portable vaporizer, and after a lot of research, I went with the DaVinci Vaporizer. Wow. It's smaller and cooler looking out of the box than it is in the pictures. I read the instructions when I got it, and found they were kind of hard to understand. I spent a little time watching videos and it made it much easier. After using water pipes, I'm really impressed with this vaporizer. What you inhale is noticeably cleaner. Of all the heat settings, I like the higher ones, I get good sized clouds on these settings. I take long draws and can get about 7 or 8 good ones when I fill the chamber up most of the way. I get about 5 sessions on a charge and I'm happy with that. One word of advice. Use a really good grinder. It makes a difference and lets you get the most out of the vape. I wanted a vaporizer, but didn't have a clue what I wanted. VaporPlants customer service guy guided me through different models and sizes. And we decided on the Davinci vaporizer, I am really impressed with it. I will be purchasing a small vape pen from VaporPlants.com shortly! I tell everyone to come to this site for the very best vaporizers; because any questions are answered thoroughly, and in the nicest way, whether emailing or calling. The site is setup so nicely that it's really easy to get around, and shipping time is excellent. VaporPlants has my loyalty! I bought a higher priced Davinci vaporizer from these guys, and unfortunately, something was wrong with it when I got it. I contacted customer service, and they not only sent out another one ASAP, but also helped me send the broken one back, it was easy and totally uncomplicated! I love this site, and will be buying everything for my vape from them!